Animated photos are really videos in disguise — but a new tool could help photographers create moving images without video. Corel has unveiled PhotoMirage, a Windows-only software that animates a still photo to create a GIF, WMV or MP4 from a single image. PhotoMirage works by placing animation points over the image, then telling the software which way (and how fast) to animate those pixels. There’s no artificial intelligence involved, the program just grabs and moves those pixels based on the settings the user chooses. Anchor points tell the software which pixels to leave untouched. With those tools, PhotoMirage can do things like add motion to the clouds the sky in a still photo, or animate a body of water. The result is similar to a cinemagraph, but starts from a single photo instead of a video. The program is compatible with JPEGs, as well as RAW images and other formats like TIFF and PNG. Because the software blurs motion in the image, the program currently works best with blurred motion in images with sky or water. Corel says the new program is designed with a simple interface to allow anyone from basic users to professional photographers to use the tool. The animation points are a drag and drop-style tool, while the program also includes more advanced options like visibility layers. 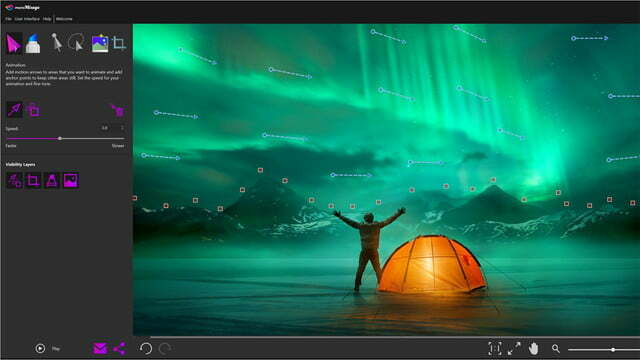 Options like crops and a one-click Smart Photo Fix edit are also included in the program. PhotoMirage’s export option is designed for simplicity too. The export allows users to choose the social media destination, then will automatically format the post to the proper requirements for that network. The program is designed to create cinemagraphs and GIFs from a simpler process than a video. Grabbing and moving pixels won’t create the exact result as a video — grabbing and moving pixels, for example, isn’t meant to animate something complex like a person. Corel isn’t the first to try to simplify the cinemagraph — a program called Plotagraph from a startup by the same name also animates a still photo for a similar effect. Artymate is a Photoshop plug-in that also has a similar focus. The Corel PhotoMirage is available as a $70 one-time purchase. The program is Windows only and requires Windows 10, Windows 8 or 8.1, or Windows 7.